What a brilliant sound! This is seriously one of the better live recordings I’ve heard in years and to make matters even better the band in question is none other than legends PINK CREAM 69. Well, perhaps they never had their 15 minutes of MTV fame but today they’re regarded as legends at least! As the title hints at, this is a GERMAN live recording which means a lot of crowd contact and “party stimmung”. If not for David Readman on vocals they’d probably be speaking german between songs as well. The majority of songs on this live set belong on their first couple of classic albums which means they’ve had quite a few years of aging. 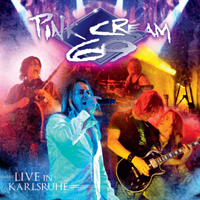 One can truly sense that it is pure joy for PINK CREAM 69 to be performing these songs in front of a homeland crowd – balls out and no remorse! If I have to be critical I would point out that 2 discs of live music is 1 disc too much. Don’t get me wrong; all the material sounds good and the level of energy is kept up but you need a bit of diversity after a full CD of live music. Double live albums were a thing of the 70s if you ask me. But hey! It’s still one helluva album.